Coconut milk replaces traditional heavy cream in this veganized variation. Not a coconut lover? Not to worry, the coconut is dominated (in a good way) by the roasted garlic. In a medium skillet, heat the olive oil. Add shallot, letting cook until softened. Open the can of the coconut milk, and skim the thick cream from top, saving the thin liquid on the bottom for another use (smoothie?). Add the cream, nutritional yeast, and nutmeg to the skillet. Squeeze garlic from the bulb onto a cutting board and mash it a bit with a fork. Add it to skillet, mix well, and season with fresh ground pepper and salt to taste. 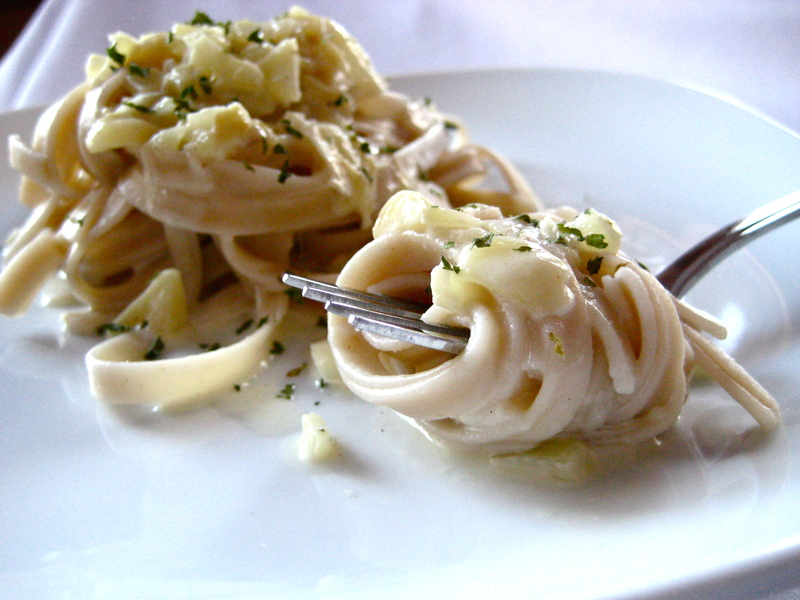 Toss with the fettuccine and garnish with parsley. *To roast the garlic, slice a thin layer from the top of a bulb and wrap in foil. Bake in a 425 degree F oven for about 45 minutes until softened, then squeeze out the creamy cloves. Thanks for your recipe! What fettuccine do you use? Tinkyada. I have a couple favourite pasta brands, but that is the one I use for fetuccine (I am not sure others make it).